Congratulations on your new job Bailey!! That's fantastic!!! Congratulations on the new job!! So exciting! Thanks, thanks! I'm so pumped! Congrats on your new job! I have also been thinking about doing more of what fires me up and less of what drains me this month. Such a good idea to re-evaluate how you spend your time. I do the same thing every morning, check FB and instagram immediately, when what I really need to get me through the day is to hear from God's word. <3 I hope this month fuels you and you are full of rest and peace and joy! Thanks sweet girl! It makes such a difference. 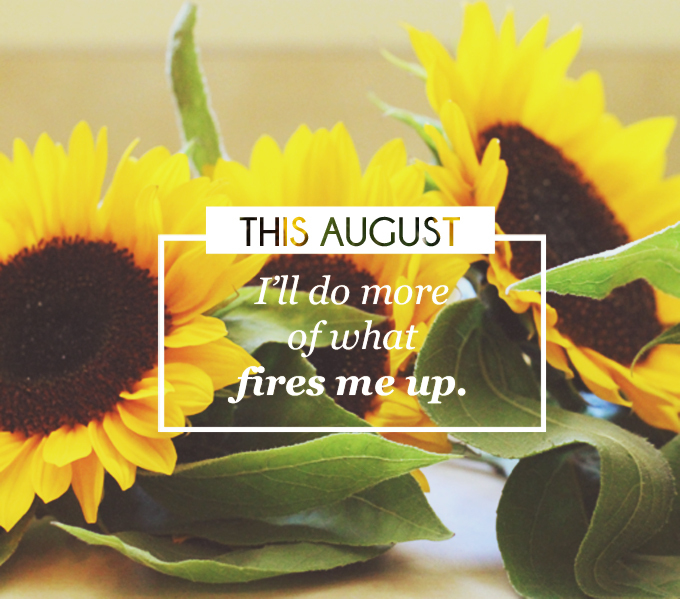 We were made to thrive and He is the center of that :) I hope this month is full of what fires you up, too! Let's take some time to really enjoy what's in front of us. I need to have an intentional August. July was so busy- I put off spending time with Jesus too. You should do an Intentional August link party, so everyone can see what everyone else is doing! Amen girl. It's so easy to get all dried up and exhausted without even realizing it! I love the month of July (mostly because of the 4th), but by the time it comes to a close I'm thankful for the way August is an intro back into the routine of fall and winter to come. So on board for Intentional August. Thanks girl! I'm so excited!! CONGRATS on the job, Bailey!! Anthro is such an inspiring place to work when it comes to decor! Congrats on the job girl! New follower from Pinterest! Can't wait to see more blog posts! Ooh, welcome! And thanks, dear :) So glad you found your way to my little corner of the internet. Can't wait to check out yours, too! Love this post & the same quote from Lara's newsletter resonated with me! Congratulations on Anthropologie! I live in Seattle and may find myself running into you as I shop for back to school! I'm 100% with you when you say you need to be in the Word before looking at Twitter & Instagram in the morning. I turn off my alarm on my phone, check my email and then hop onto Instagram for a good twenty minutes! That is time I can be using to start my day on the right foot, depending on His strength instead of mine. Let me know if you need an accountability partner with that one! Hope you're having a great week! Praying for you! And I will absolutely take you up on the offer of being an accountability partner, goodness knows I need one. I reach for my phone then *scrollscrollscrollscroll*, it's just insane. And so senseless. He is the one that refreshes the soul. I shouldn't just be hitting the refresh button on Twitter. Praying for you as you prepare for school! What an adventure! Thanks girl, and welcome! So glad you stopped by :) Hope the rest of your weekend is rest-full and stress-free! Congratulations on all these new beginnings and happy (belated) birthday! Although I can't always afford what anthropologie has, just perusing their bricks&mortar or online shop keeps me inspired for days. So lovely. (: So excited for you to be surrounded by that beauty. I love your intention to start doing more things that "fire" you up. I most definitely agree with handwritten letters and blogging being on that list. (: August is going to be a great one. Congrats on the job! I would love to work there just to be around all that beauty haha. I'm so glad you posted about being intentional. That has been my theme this year but I've started to slack off a bit lately. This was a great reminder! Handwritten letters are a delightful treat in today's tech obsessed world they really stand out. Thanks for joining the linkup.